After my previous day trip in Mexico city, September last year while in transit to Playa del Carmen, I was really intrigued by the megacity and decided to visit it for a longer period this time around. I booked my round trip flight through American Airlines for $525, which I felt was a bit on the higher side for this time of the year. After landing, I cleared immigration at the Mexico city airport, which was not as express as the last time around(! ), and I had to wait 30 min for my turn to get my passport stamped. After clearing the immigrations, I went on to exchange my USDs for some Mexican Pesos. The bank Santader ATM, at the airport, was broken, so I decided to exchange the cash I had. Although, ideally you would want to get the Pesos at the ATMs at the airport, you must have some backup cash for these kinds of situations. For transport to the hotel, this time I decided take the off beaten path and took the Metrobus to the city center. The Metrobus is a novel and unique mode of transportation introduced by the Mexican government to ease traffic congestion in the city. All buses have dedicated lanes on the city roads and it cost only 30 pesos (~$2) for a one way trip to downtown from the airport. There is a booth located near gate 7 at terminal 1 at the airport, where you can purchase the card (10 pesos) and put balance on it. There're armed guards on the bus rides, although I really didn't really feel the need for one. They have many more routes and destinations within the city, which cost 5 pesos for a single ride. The bus dropped me about 2 block from the hotel and I only had to walk a couple of minutes. 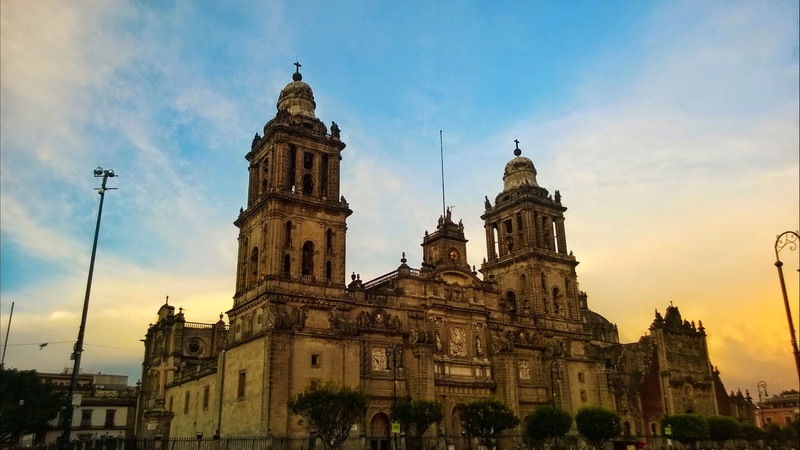 Day 1: I had booked an Urban adventures' Mexico city markets tour and the guide promptly met me at 8:45 a.m at a pre-decided spot near Zocalo, the city center. The first stop was a relatively unknown market known for it's murals painted by the slaves who worked there. The guide briefly explained about the history of that market before moving on to the public transport to get to the next stop. The next market was a more typical city market, with every thing ranging from vegetables to live pets (Yes, live dogs, rabbits, mice etc.) and spices to magic potions & healing herbs, on sale. After a bit of exploring, we moved on to tasting some Mexico city street food. 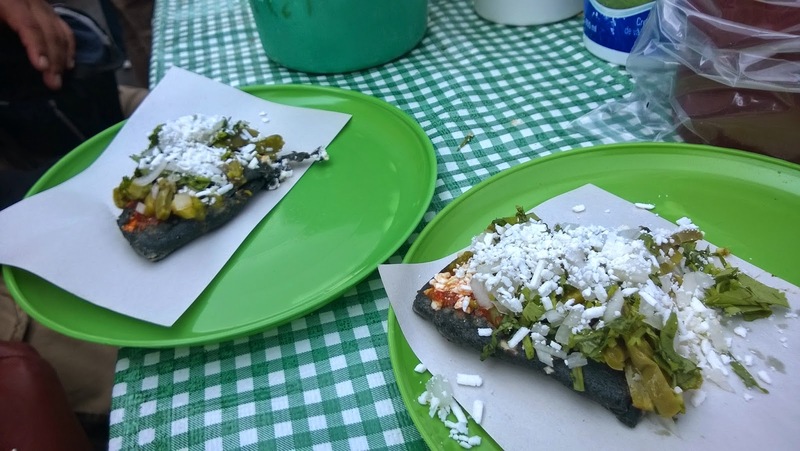 We tried a dish named Tlacoyo, made out of blue corn, cheese, cactus, refried beans and salsas, grilled together on a big pan, making a tasty conglomeration. 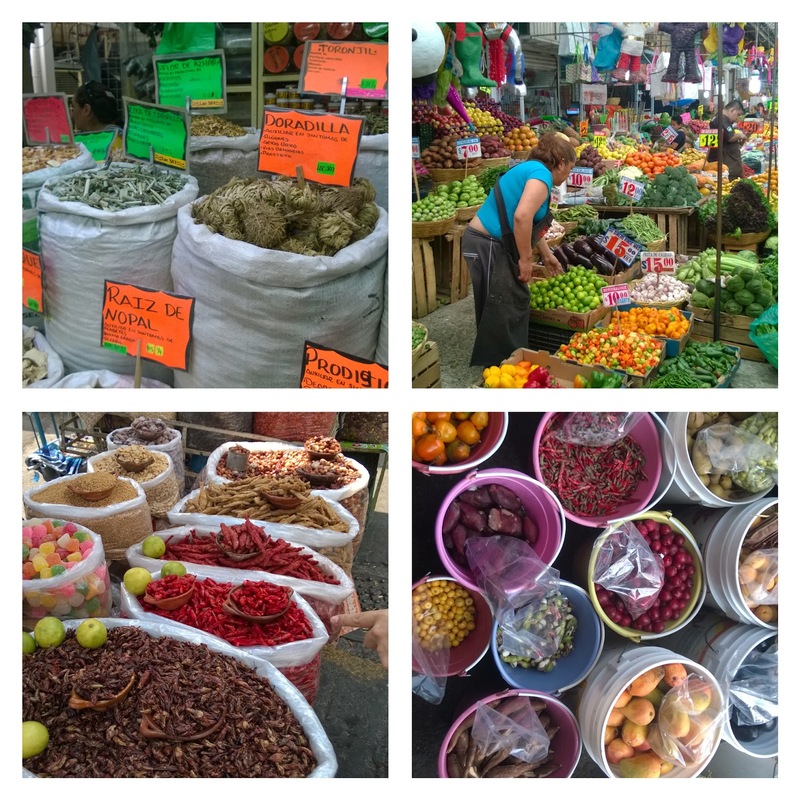 We rounded off the tour with a trip by the metro train to Mercado de Jamaica and the flower market. On my way back, I decided to take a little detour to Palacio nacional, which used to be the residence of the incumbent Señor Presidente of Mexico. The entry is free, albeit there're airport style security checkpoints to get in. Every year September 15, just before midnight, the president of Mexico gives the Grito de Dolores (Cry of Dolores), in a ceremony to commemorate Mexican Independence from the Spaniards. About 1/3rd of the palace is open it to public, you can spot some amazing murals painted by Diego Rivera on the walls near the entrance of the palace. 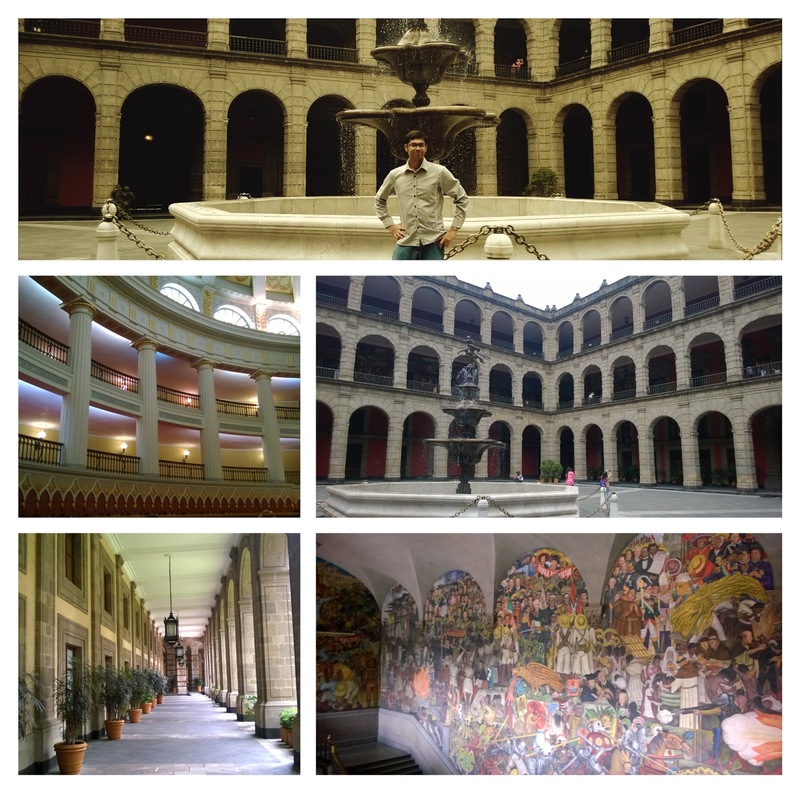 The murals represent various stages of Mexico city history, from the Aztec period to the modern era. ortant points of interest within the central area, like Plaza a la revolucion, Angel of Independence and some suave neighborhoods of the city. Day 2: Next day, I decided to go to the famous anthropological museum. I had to take a taxi from Zocalo to get there, as the metrobus doesn't have a route there, and I was skeptical about taking the metro train by myself. The taxi cost about 50-60 pesos for a one way trip. (Be sure to ask for the taxi meter before you board it, though). 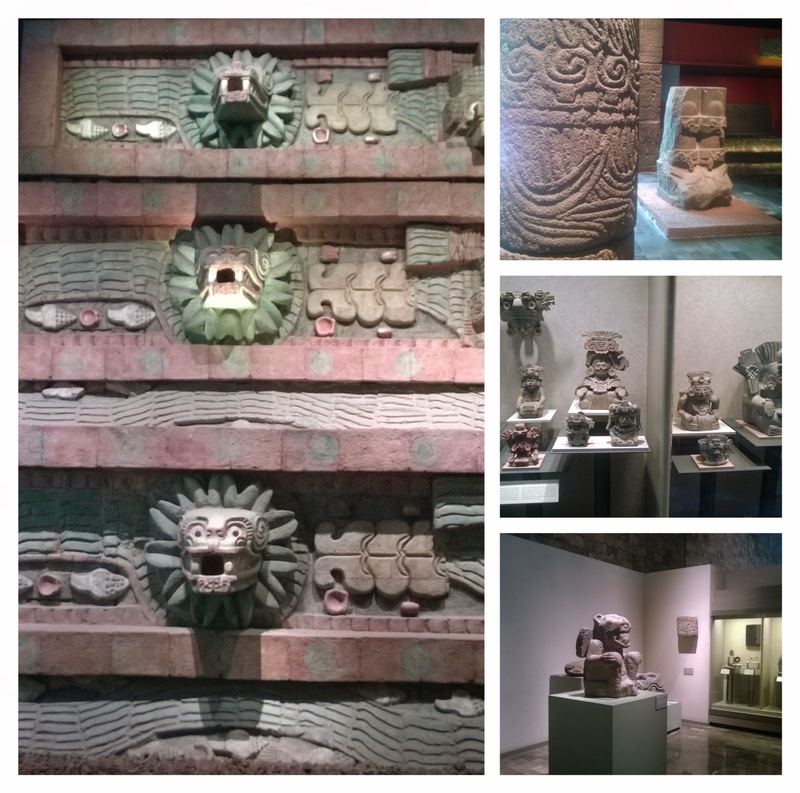 The museum contains artifacts from the pre-Colombian era of Mexico, including the Mayan and Aztec and empires. Depending on your level of interest, you can spend anywhere between a couple of hours to the whole day, with 64 pesos as the entry fee. I came back in the afternoon, as evening, I wanted to go to the top of Torre Latinoamerica (Latin American Tower) and catch sunsets panoramic views of this big city. There is a restaurant and bar on the 41st floor of the tower, just one level below the viewing area. Here, you can have a drink or some food, relax and enjoy the views of city. So it makes more sense to go here, than spend 80 pesos to go just to the top. Day 3: I had booked another tour with Urban adventures, to visit the pyramids at Teotihuacan. The pyramids were built during the pre-Colombian era and were discovered by the Aztecs who named them Teotihuacan. The site is located about 25 miles north of Mexico city and hence, is technically outside of this city. We had to change a couple of metro trains and eventually take a 45 min public bus ride from one of the stations to get to the site. The ride was comfortable and air-conditioned. Once at the site, I was amazed at the size of the main pyramid, which is the pyramid of the Sun. 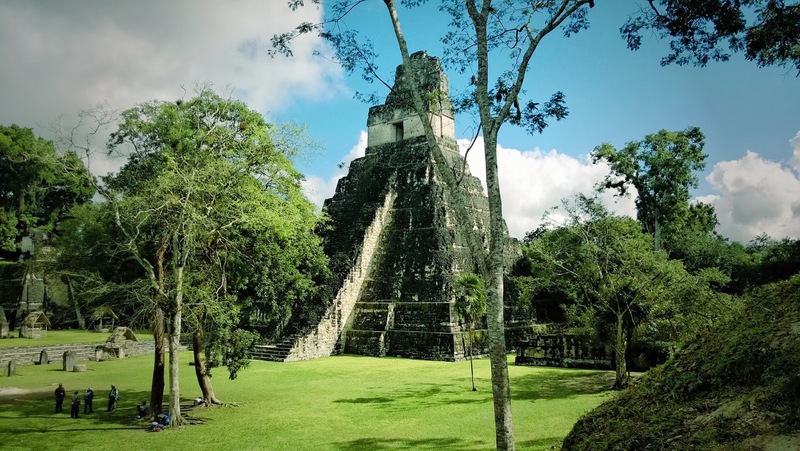 It is probably the widest pyramid I've seen in North/Central America, although not the tallest (that credit goes to Temple I in Tikal, Guatemala). The guide briefly explained us the history and legend behind the pyramids as we climbed up to the top. Apparently, nobody has any concrete evidence regarding the purpose of these pyramids, and whom they were built by. The excavations at this site are still in progress, and they're still uncovering more and more mini-pyramids near the main site. We had to hurry to the next stop as it was just about to start pouring, we could feel it, as the wind had picked up and there was a nip in the air. nt. 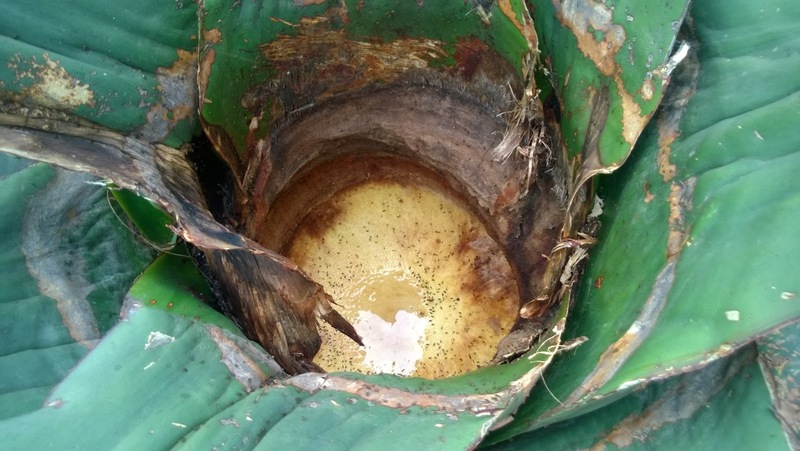 Next stop, was a family who specialized in the production of delicacies made out of cactus. Final stop, was a "dinner with a local family". Although, we never dined with the family themselves, we were served some salad and tamarind chicken, which was delicious. After dinner, we took the bus back and a taxi to get to Zocalo. 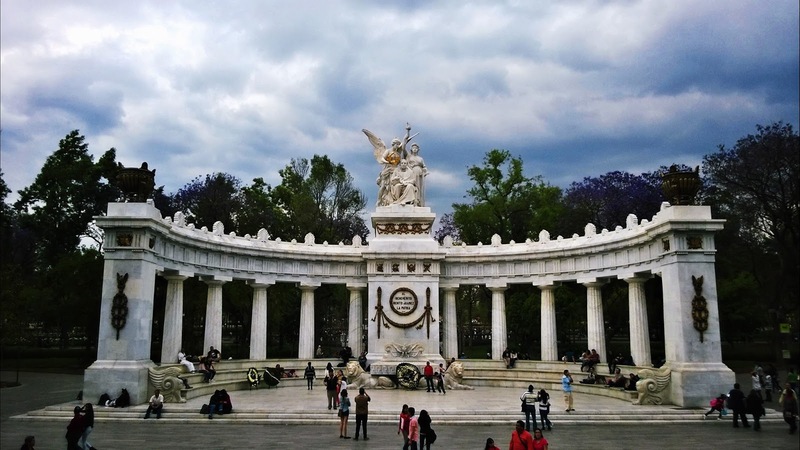 Day 4: For my last day in the city, I had booked a tour to the Xochimilco hanging gardens, located about 45 minutes from the center, but technically inside Districto Federal, the Mexico city district. These are artificial islands developed during the Aztec period, as the farming land was scarce. 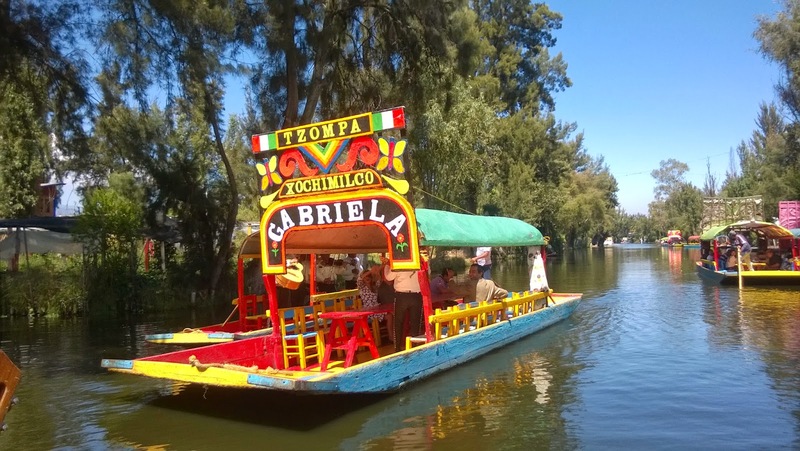 We boarded a flat-bottomed "trajinera" with our guide and drifted through the lovely floating gardens amid a network of small canals – it was difficult to tell that we were still inside once of the largest and most populated cities in the world. During the ride, was saw every thing from floating mariachi band to salesman selling ornaments on boats to even food being cooked and served right on the boat! 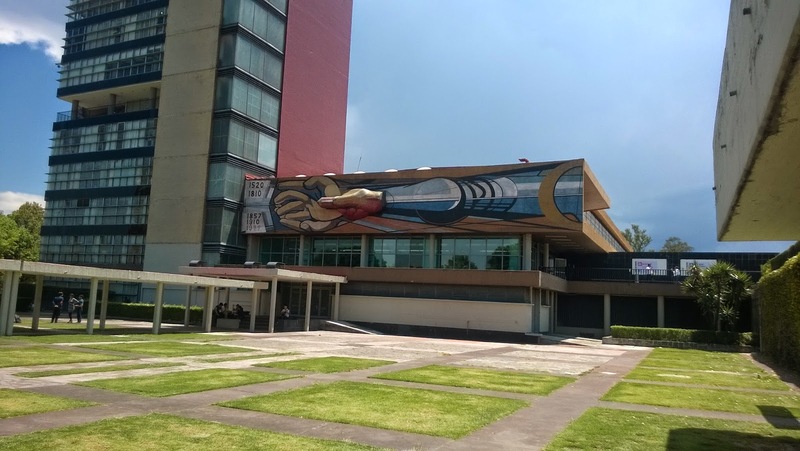 After the boat ride, we moved to the next stop, the National Autonomous University of Mexico. This is one of the most prestigious universities in the entire world and is constantly ranked among the top 100. They have engineering, arts and even a medical school, and best part is, it costs 1/3 of a mexican peso (2 cents U.S.) as tuition fees for an year! Of course, the competition to get in, is cut throat, but it makes quality education within the reach of those who can't afford private schools. 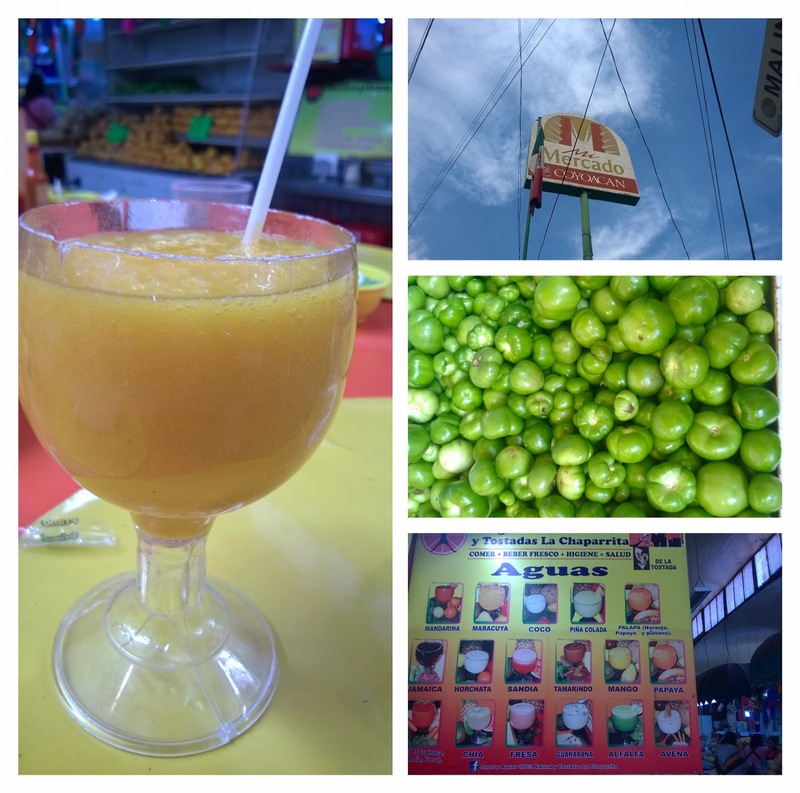 We stopped for lunch at the Coyocan market, where were had tostadas and aquas (juices). Our final stop was at the Frida Kahlo museum where her works were on display. The museum was actually her last home, in Coyoacan, where she spent her final years. The museum contains a collection of artwork by her, and is one of the most visited in Mexico city. That brought to end an interesting and educating five days in one of the largest cities in the world. Given it's proximity and direct flights from most major cities in the U.S, I'm surprised why more people don't visit this historic and cultural megacity. The city is clean, safe, the people are friendly and there's lots to do here!